In 2005 many of the SAR teams in South Western BC responded to assist North Shore Rescue with a search for a missing American tourist on Grouse Mountain. What started as a simple missing hiker that local SAR teams usually resolve in under a few hours turned into one of the highest profile searches I’ve ever responded to. That’s Destin Sandlin from Smarter Every Day, a bona fide YouTube star with over 4 million subscribers. He’s flying with another up and coming YouTube star Bradley Friesen – a guy I happen to know since I was in high school. That particular video has been watched 44 thousand times. He’s flying over my SAR team’s response area. That’s even bigger YouTube star Casey Neistat, who, although he has slightly fewer subscribers, has a much more active following. That video, posted 5 days ago, has been watched 1.8 million times. They’re also flying through my response area on their way to the Bridge Glacier. What makes a search “High Profile”? It’s pretty simple – any search that that has some feature that the media may find interesting, or any search that involves scrutiny above and beyond the usual. For example, a missing child is going to attract attention. My friends at Sparwood SAR dealt with the search for missing Kienan Hebert, a 3 year old boy (at the time) abducted from his home. Initially the subject of an Amber Alert, the SAR team responded with the assistance of SAR members from across BC under international media attention. Thankfully he was found not long after. In another example, one of my first experiences as a SAR manager was for two missing autistic young women near Sasamat Lake. The first subject was found relatively quickly, but over the next three days, in scorching August heat, we searched for the second subject under increasing pressure from national media. Questions on whether she was alive, resource management, etc were being asked by the media, and many members of the public volunteering to assist us. Thankfully again, we managed to find the second subject after she spend over 70 hours in the bush. At the top of this article I mentioned the search for David Koch. Initially it seemed like a simple search – a visiting tourist decided to hike down the Grouse Grind. My team was called in during the second or third day of the search. As time dragged on, the search gained the attention of people on Social Media – something that wasn’t even on the radar of most people at the time. It turned out David Koch was connected through the tech industry and on social media. Government officials in his home state of Wisconsin contacted the government of Washington State, and US Park Rangers were sent to assist us on the search. This is how I came to be leading a group of highly skilled mountain guides from Mount Rainier National Park (among other places) on a search of a relatively minor and non technical mountain near Vancouver. In the end hundreds of members of the public came out to assist, and the search dragged on to 12 days. We managed everything from bloggers posting from the field, ill-equipped volunteers, public critiscism for not accepting certain people as searchers, and I encountered a member of the family attempting his own search in steep, rugged bush wearing nothing more than a plastic bag as a rain jacket, and a pair of street shoes. Unfortunately David Koch was discovered deceased a few days after the search was called off. How does a high profile search influence SAR Management? I find it distasteful to say this, but it’s true – the higher the profile, the longer we search. I’ve been on a search for a missing person where we called off the search after one day. I vividly recall hearing that the friends and family of the missing person found him deceased near a road the very next day. I was not part of the management team, so I am aware that I did not have all of the details or the reasons why the search was called off. However, I feel that the missing person was not given equal treatment to other searches with similar circumstances. Going back to the search for David Koch, I feel that over the 12 days we put an insane amount of resources into the field. My current experience makes me feel that we would not have expended so much effort if he was not a well connected individual. High profile searches also bring in more media – which add pressure to decision making processes. I believe this pressure changes how the search is run. Where a SAR group may decline to ask for help from the public most of the time, under pressure they may begin accepting some assistance. This is almost always a bad idea as, in my opinion, it takes more trained resources to manage the untrained searchers than the benefit they deliver, especially in difficult terrain. SAR managers will feel the need to demonstrate they are doing everything they can to find the missing person, and the pressure of media and public attention can be difficult to handle. The most important thing to do is to appoint a public information officer (PIO). 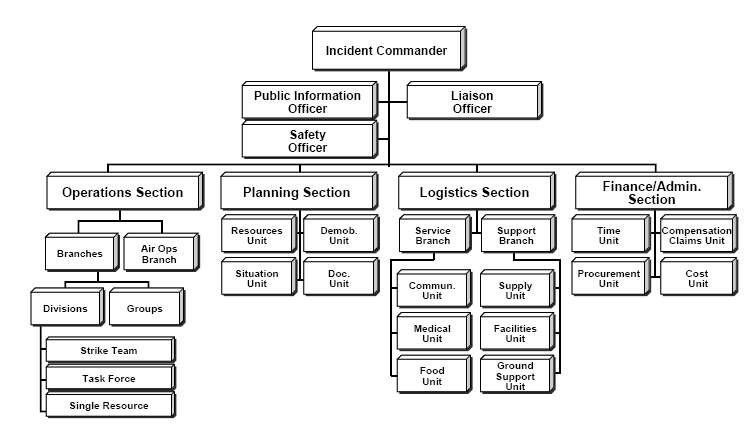 He or she is indicated right at the top of the standard ICS org chart . SAR groups who do not have a trained PIO should ask their police force of jurisdiction for one if they have not been offered one. The PIO will schedule two media briefings a day and plan all information disclosures. Their role is to take the pressure of media attention away from the management group. By controlling the flow of information the PIO can request the public’s assistance in a controlled manner, engage the media, and reduce the influence of misinformation by providing a consistent and authoritative voice for the effort. The absolute worst thing that can happen in a high profile SAR incident is for the public to get the impression that the SAR group needs help. The chaos that ensues when the public attempt to volunteer either in person, or via goods or services, can derail any organised search effort. Under no circumstances should a SAR representative say that they need help or assistance without a clear plan on how to handle the overwhelming response. Any high profile search is bound to be a large search to start with, so sticking with the ICS system is going to serve you well, but especially so for the media attention, and the ability to change to fit the situation. Don’t hesitate to assign more people to your command staff to be prepared to deal with issues as they arise. Ultimately, Search and Rescue and emergency management is all about adapting to the situation. You are not in control of who goes missing, but I can only hope you treat each missing person with equal care and attention. A high profile missing person brings its own pressures and challenges. The Incident Command System is your friend for adapting to these challenges. Assign a PIO for every task so you’re ready for when a task with lots of media attention comes up. Along with working with the police, I would make the suggestion that SAR groups get in touch with their local emergency program coordinator (depends on the jurisdiction) who may be able to assist with the PIO role, possibly sourcing a municipal PIO or connecting SAR with the PIO training available from JIBC. I personally took the JIBC SAR training as a SAR manager and it is available as a sponsored course from EMBC for volunteers. It also helps to find a few SAR managers willing to be the PIO during non-task times but also during searches with media presence. This spreads the load for the managers and allows the SAR team to be more effective overall. Building a relationship with the local media folks pays massive dividends as well. If they are around searches, they will know what to cover and when and will learn when to stay out of the way. This builds better media management for the SAR team and the media get their story. I was SAR Manager for most of the Koch search and a lot of what you say is true BUT I think there is more at play than just the high profile of the subject. Too much to discuss in this type of forum. Lunch some time?